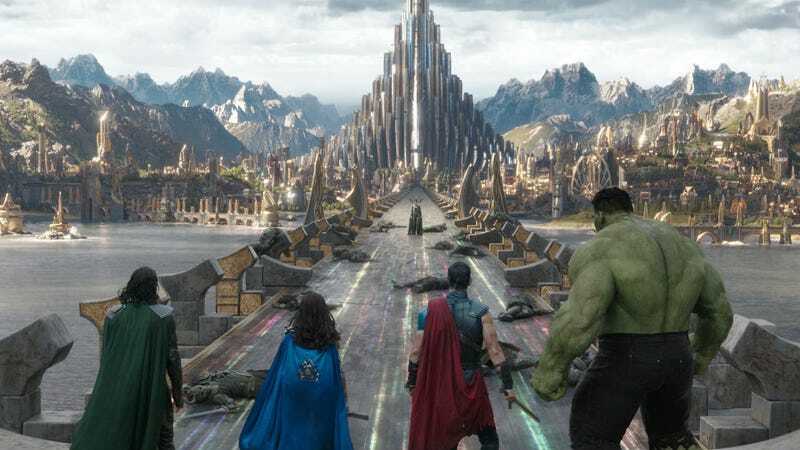 As with many Marvel films, Thor: Ragnarok left audiences with more than a couple of unsolved mysteries and unresolved issues after its final end-credits scene. Here are 10 questions we have the answers to, courtesy of Marvel Studios president Kevin Feige and Ragnarok director Taika Waititi—and well as the five biggest questions the movie left unanswered. Whose spaceship was that at the end? In the first of two end credits scenes in Thor: Ragnarok, a very, very large ship comes upon the craft holding Thor, Loki, Hulk, and the rest of Asgard. Nothing about it is specified in the film, but if you assumed it belonged to Thanos, it does. Feige told The Wrap the ship is Thanos’ Sanctuary II, named after the rocky domain we saw Thanos in during Guardians of the Galaxy, itself named after the H-shaped ship he occasionally used in the comics. The Infinity War is about to begin, so it make sense Thanos has upgraded with a new ride. How does the credits scene link to Infinity War? The Avengers: Infinity War trailer Disney debuted this summer had a scene featuring Thor, floating in space, being picked up by the Guardians of the Galaxy. Did Thanos blow up the Asgardian ship or something? Feige told us it’s not that simple but “it is a fairly direct bridge” between the two films. So, like Waititi has previously stated, this Infinity War scene is not a spoiler for Ragnarok. What happened to the Tesseract? In Ragnarok, there’s a moment when Loki walks through Odin’s vault and pauses at the Tesseract, which we know is also the Space Infinity Stone. We don’t see what he does with it but we know two facts: 1) by the end of the movie, Asgard is now gone; and 2) there’s a scene in the aforementioned Infinity War trailer of Loki handing the Tesseract to a large being. Therefore Loki almost certainly grabbed it before leaving the vault. Waititi had a simpler answer. “Lady Sif is an actor in New York on a TV show,” he said, which is the real reason. Alexander’s schedule shooting the show Blindspot didn’t work with Ragnarok. Whether we’ll see her again in a Marvel movie is anybody’s guess. Are there any Easter eggs to look out for on a second viewing? Surely, but Feige pointed out one scene in particular: “The big Easter eggs are on the side of the Sakaaran palace,” he said. “There are [statues of] previous Grandmaster champions that we see as one for Hulk is being constructed, and those are all Easter eggs for the comics universe. They may or may not show up in the cinematic universe but we thought it would be fun to celebrate them.” The big one to look out for is Beta Ray Bill, the horse-headed alien who played a major role in the comic storyline by Walt Simonson that much of Ragnarok is based on. What was the deal with Hela calling Odin’s Gauntlet a fake? As Hela walks through Odin’s vault she sees an Infinity Gauntlet and quickly shoves it off its perch, saying “fake.” It’s hilarious, but also a very important moment. Of course, we know that didn’t work. Thanos has the real one, as we saw during the post-credits scenes from Age of Ultron. Why did the Warriors Three die so quickly? At the beginning of Thor: Ragnarok, several of the most important characters from the previous films die almost immediately. First there’s Fandral and Volstagg, followed by Hogun. Together they’re known as the Warriors Three, and Feige explained to us that their deaths, while unceremonious, served a larger purpose. Why didn’t the trailers have Thor with his missing eye? One of Hela’s most lasting acts in Thor: Ragnarok is ripping out Thor’s eye. But if you paid attention beforehand, trailer shots like the one above take place after his eye has been taken in the movie. The same goes for all the Thor scenes in the Infinity War footage shown at D23 and San Diego Comic-Con. Feige told io9 the misdirection was a conscious decision by Marvel to keep the eye removal—and Thor’s eventual eyepatch at the end of the movie—a secret. Since removing the eye was done via CG in some scenes, Feige explained that all Marvel had to do was simply leave those shots alone. Who are the actors in the play? This is an easy one. Early in the film Odin (who is really Loki) is watching a play about himself, loosely—very loosely—recapping the events of Loki’s “death” in The Dark World. Turns out, those actors are actually a few notable stars in cameo roles. The credits reveal that Sam Neill, best known for Jurassic Park and who worked with Waititi on Hunt for the Wilderpeople, is Odin, while Luke Hemsworth, the Westworld-starring brother of Chris, is playing Thor. As for Loki, it’s not credited but that’s Matt Damon. All the world’s a stage! Why did Jane dump Thor? Okay, so we know the real-world answer—there have been rumors of Natalie Portman wanting to exit the Marvel universe since Thor: The Dark World lost its first director, Patty Jenkins, and Marvel was seemingly more than okay to replace her role with Valkyrie. With Portman unlikely to be willing to return even for a hasty exit scene, a scene where some New York City tourists make an offhand remark about the end of Thor and Jane’s relationship makes sense from a production standpoint. But it’s a disappointing sendoff to an important character in these movies, and it would’ve been nice to see a stronger acknowledgement of it. After all, Jane introduced Thor to the ways of modern Midgard. Plus, if the breakup was public enough that passers-by can just casually mention it to Thor like it’s common knowledge, there’s clearly potential for an interesting story there. It’s a shame we don’t have an in-world answer—for this or for the following four questions. Who else is Doctor Strange keeping track of? Doctor Strange’s presence in Ragnarok is brief but important. Sure, he couldn’t care less about actually pointing Thor and his meddlesome brother in the direction of Odin, but he knows of Loki’s immediate arrival on Earth thanks to a list of potentially harmful beings the Sorcerer Supreme is now tracking as part of his mystical duties. But Loki can’t be the only person on that list—who else is Strange watching? And will that early-warning list be how he makes his way into the events of Infinity War? How many Asgardians are actually left? Asgard has always looked huge, but the amount of civilians that survive the events of Ragnarok seems awfully small for what Asgard was. Sure, a lot of Asgardians actually die in the movie—Hela basically wipes out the entire army, and presumably some civilians die on the Bifrost during the film’s climax. But even then, the crowd that makes it onto the ship seems rather small, as did the band of survivors Heimdall was sneaking out of the city. It looks like there are only a few Asgardians left in the Marvel Cinematic Universe. Will Asgard be rebuilt, or is it gone for good? So Asgard isn’t just burned to a crisp in Ragnarok, it straight up explodes, violently. Which makes sense, as the titular apocalypse is all about Surtur destroying Asgard and most of the people in it. But, in the comics, Ragnarok is a cycle—everything dies, but then everything is reborn, including the realm of Asgard itself. Even when Thor broke the “endless” cycle with the final Ragnarok in his 2004 comics, Asgard was rebuilt (and started hovering over Oklahoma... it’s a long story). But there’s a sense of finality to the final moments of Ragnarok, even if Asgard’s total destruction gets played for a laugh. Is it really going to be done for, or will it be like it is in the comics and come back at some point in the future? Does Thor even need a new Mjolnir now? Thor may lose Mjolnir early on in the movie, but by the end of it, he’s a thunder god powerhouse even without his Uru hammer. He goes from occasionally generating little crackles around his fingertips—sparkles, as the Grandmaster dubs them—to, by the end of the movie, flying and flinging lightning bolts around like a young, incredibly muscled Emperor Palpatine on speed. It’s never named, but considering Thor flashes back to his dead father in the moments before he really unleashes this new power, it’s clearly meant to be the Odin Force from the comics, a powerful magic only useable by the ruler of Asgard. It makes for some amazingly cool scenes, as Thor fries the undead hordes of Hela’s armies with ease... to the point it makes us wonder if it’ll ever really be worth it for him to try to somehow get Mjolnir back. Sure, the hammer is iconic, and will probably make its way back into Thor’s hands at some point. But can he just spend Infinity War shooting lightning bolts out of his hands like a maniac? Pretty please?